Since before Christmas I have been struggling to see and my creations have taken longer to produce than normal. This is because of a change in the lighting in the craft room (which is really just one end of my partner’s son’s bedroom – he’s not around much). Both the boys are considerably taller than Mark and I and were hitting their heads on the light fittings! Action had to be taken. The lovely new fittings that we chose are virtually flush to the ceiling but they give off less light that the old ones and I was finding it hard to sew in the evenings – threading the needles was taking forever, colours didn’t look right and I was finding inspiration hard to come by as a result. All is sorted now thanks to a trip to Southampton to return Andy to Uni. He’s let me borrow his lovely little spot light which was surplus to requirements (this was evident from the layer of dust that it was covered in, although to be honest, close inspection found that most of his room was covered in a layer of dust and the duster I had provided him with, whilst it had made it out of the box, lay forlorn in a corner! ). 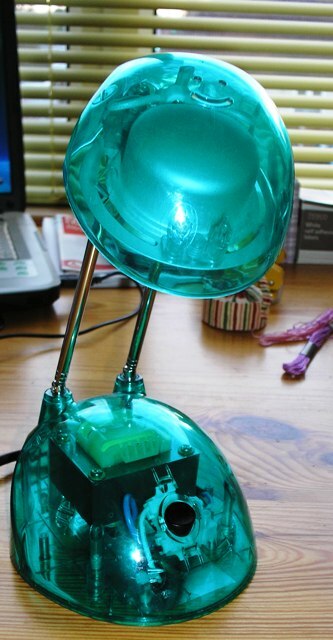 Here is the little smiley light and what I’ve made now my darkness has been illuminated! 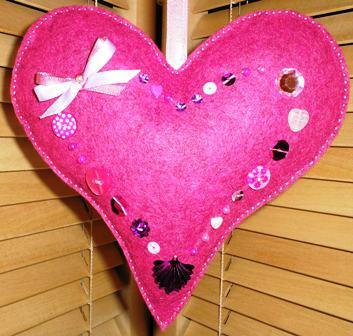 This bright pink softly padded hanging heart measures approximately 17 cm x 17 cm and is decorated with sequins, beads, buttons and ribbon. I think I will put it on sale at Crafter’s Corner at Traders, Littlehampton for £6.50 – do you think it might be a good seller and it’s worth me making another one? … or maybe two! Valentines Day will soon be here so it’s time to think about how you will show that special someone that you really care. We would all like to be showered with romantic gifts (or even just one! ), such as red roses, a candlelit dinner for two, the odd diamond, but alas the majority of us are not that lucky. Romance seems to desert our other halves when things become more permanent. Why is it that romantic partners are in short supply? Maybe one of the reasons nowadays is the financial pressure that we are all under – it’s more difficult to justify splashing out when there are other potentially more important calls on our hard earned cash. That’s where Pip’s Place can help! For just a little more than the price of your weekly coffee in Costa (other coffee houses are available! ), you can purchase for your loved one a hand made hanging heart like the ones at the end of this post. They are beautifully sewn and decorated by me with buttons, bows and small hearts in a variety of designs. They are a unique gift for your Valentine that will last long after those roses have died and been thrown away or the romantic dinner is just a memory, although they may not outlive the diamond! The hearts are softly padded and have a ribbon attached. One style measures 5.5cm x 7.5cm approx, the other measures 7cm x 7cm approx – ribbon lengths vary. A selection are available in my Folksy shop and at Crafters Corner at Traders in Littlehampton. Alternatively, please contact me direct. If you like my designs please have a look at Pip’s Place on Facebook, let me know and share my page with your friends. I am sure I’m not alone in my aversion to social networking sites. It seems rather disturbing to me that people could be interested in the minutiae of others lives to the extent of what they ate for breakfast, have been watching on TV or bought in Tesco – does anyone really care or is it just a means of filling the vacant hours and minutes between interesting things happening in our lives…? You may call me a hypocrite for this opinion as I am hoping you are sitting reading and being interested in my blog which, as you will be aware is about my crafty creations and I am about to tell you that I have now been dragged kicking and screaming into the social networking whirl – well it is a new year and perhaps I do need to modernise my outlook a bit! Craftseller magazine has been extolling the virtues of Facebook and Twitter to get your business known to a wider audience and I have at last taken note. Ever useful in situations where technology is key and I have no idea what I am doing, Andy was on hand to advise and guide me. At first I thought he was going to provide some simple tweeting lessons for the over 40s but after some discussion we agreed that perhaps Facebook was the place to start. So I am now the proud owner of my own ‘Page’, or rather Pip’s Place has a page where all you lovely people can comment on what I’ve eaten for breakfast! Only joking, I will aim to keep the posts relevant to crafty matters, with the odd line about Pip and the rest of the household when the need arises. I will soon be posting some photos of items I have made for Valentine’s Day (these will be for sale shortly in my Folksy shop and at Crafters Corner at Traders in Littlehampton). Please do leave me a comment or ‘like my page’ (I think that’s the right phrase!) and spread the word about Pip’s Place.